what type of helicopter is that? This is Mi-10k, soviet heavy transport helicopter. “k” means “kran” – crane. This modification was made for lifting works/ http://ru.wikipedia.org/wiki/%D0%9C%D0%B8-10 Unfoturnately, the article presents on russian only. I’d really like to know whats the building in the background and when this photo was taken. Most likely the triumph palace. It is like the Triumph Palace, but Triumph Palace is already built! Surely it is Triumph Palace, but a rare view with open space in front. It is a hideous monstrosity, I doubt that it would be duplicated. Heli seems to be a Mil Mi-6 btw. Where exactlly is the point behind this picture……? Is that the building that’s seposed to be highest in Europe by completion????? nope. The highest building is Federation Tower. Башня Федерации. Construction of highest building in Europe will start in Moscow 12 June 2007. It will be “Russia” in “Moscow-City”. The Construciton will end in 2010-2011. The project by Norman Foster, author of “Cucumber” in London. Consruction cost is about USD 1,7 billion. It will be the safest building in the world because of it’s pyramidal shape. It’s about 125-130 floors and 612 meters high. 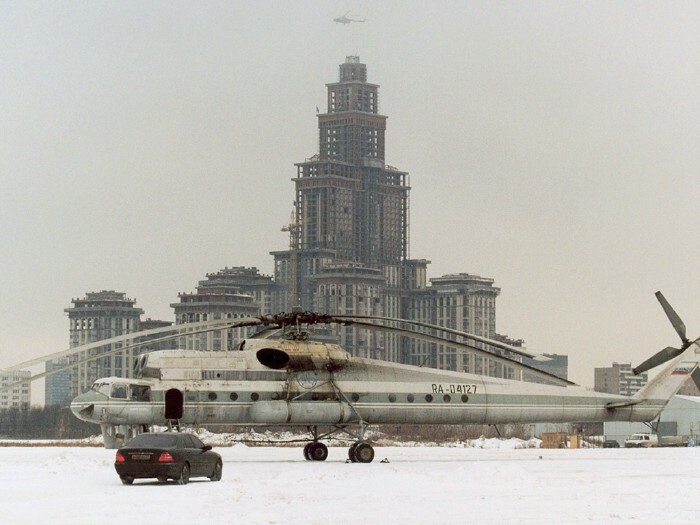 Broken helicopter is not your typical Moscow view. It seems the blog admin does his best to find the most disgusting photos of Russia. I suggest trash cans next. don’t take like that. it’s impressive. beside, I think you should upload “nice” things, if that truely are your intentions. Where have you seen any broken helicopter on this site ? It might be just rusty, but I agree, the admin’s comments are misleading. Dude, it’s the trace of exhaust fumes from engines, not rust. The chopper was used to put a spire atop this building, thus making it the highest residential building. The house itself is a rather poor attempt to duplicate the 1930s houses. It’s not a disgusting thing! This is an Mi-10 crane, and the stains are just fuel and oil stains. The stains wash off since the Mi-10 is made of titanium and alumninium. Helicopters don’t rust. The Mi-10 can lift about 15 tons, useful for constructing towers, bridges, etc. And Alaska (US state if you can’t remember) has all the decent roads, right? Have you ever been to Alaska? People live up there because there isn’t much of anything. Most of those people are weird, crazy and they like to be alone. I’m not a Texan. I’m actually from the Chicago area. But Texas does have 4 of the 15 largest cities in the US. I think it’s hilarious how you boast about Texas with statistics like that. Maybe you should travel more. Nifty. Russia has a reputation for their large helicoptor tech. If that’s the Triumph-Palace, then this picture can’t be form 2007 since the palace is already completed. It doesn’t make Russia look bad…it makes it look good to me…I want to see that helicopter! What is Englishrussia.com all about? Collecting pictures and media from Russia and distributing with wrong information and no credits? It’s not the first time that something here is described completely wrong. That’s bad for the reputation of Russia and takes away any credibility from this site. You can’t just add any information that originates in your imagination to any kind of media you run accross the internet and then distribute it as it were the truth. Relax, its just a blog with cool photos. Great photo, I’ll bet when that heli takes off that it’s quite the spectacle. It can’t be 2007 (the building has alread been constructed? I can see it from my window just now =)))). It may be 2005 or even 2004. I live not far from this place. It’s an abandoned airfield in Moscow (there are some old helis and planes). Now the city government builds much there. The place is also used as car test site (many magazines use it for test-drives). That’s why we see a good car in the picture (access to airfield is restricted). If you have money, everyone wants you. Especially russian government! hey go back to my thread and keep on posting pics of russian wilderness! No guys, this should be winter 2005/2006 – the building on the background is fininshed now ..
I’ve not read all the useless posts. This has nothing to do with rust. These are NORMAL oil leaks from the rotor going to the hull. Only who will waste money to clean the ‘copter with specialized sub-sero de-icing equipment. This chopper seems absolutely fine for me. English Russia, you are disappointing by posting such pics without any comment or any technical knowledge. Stay with cars and roads, and vintage pics. Awesome helo. Even if the photo is older than the 2007 imprint of the caption, I would love to live there. I just have to learn the language. Speaking of Texans and Alaskans…. A Texan and an Alaskan were driving together, and they stopped to go peesit off a bridge.